Seyirtepe Izmir is a collection of restaurants, event gardens and a horse riding track for amateurs. It is located on top of Karsiyaka wehere you can view more or less all over the city. A visit for breakfast in the morning followed by a 25 min horse ride in the close by forest guided by a specialist from the track. You can also enjoy the night view of the city skyline with a evening dinner however unfortunately there is no alcoholic drink available on the menu. They offer a large selection of international cuisine which can accommodate many tastes however alcohol limitation is critical to enjoy a nice evening dinner in my opinion. 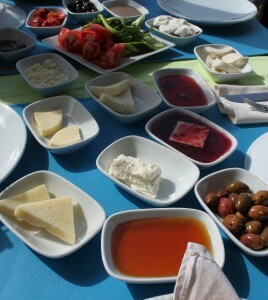 Therefore we have tried Seyirtepe: Panorama Restaurant for breakfast and was not disappointed. The selection of “Serpme Kahvalti” (Turkish style breakfast where you have mini plate of multiple dishes served for 2 people at least with unlimited Turkish Tea) for a reasonable price. The quality of the food is good and the service quality was reasonable however do not shift your expectation. The place is an average in terms of quality and service but the view is magnificent and you will enjoy your food and neglect some of the downsides eventually. We have tried the traditional breakfast which offers a good variety of options with 3 types of cheese, tomato-cucumber-green pepper sliced, 3 types of olives, cream and honey, 2 types of jam, cranberry marmalade… a full list as follows; Van Otlu Peynir, Köy Beyaz Peynir, İzmir Tulumu, Çeçil Peynir, Domates, Salatalık, Yeşil ve Siyah Zeytin, Bal, Reçel, Kaymak, Salam, Tereyağ, Tatlı Lor, Erzincan Tulumu, Haşhaş / Van Herby Cheese, Village White Cheese, İzmir Cheese, Cecil Cheese, Tomatoes, Cucumber, Green and Black Olives, Honey, Jam, Cream, Salami, Butter, Fresh Curd, Erzincan Bag. Eatinizmir recommend Seyirtepe because of the view, reasonable prices, outdoor activities and relax atmosphere. We hope you will enjoy it as much as we do.